The internet has changed the way customers purchase products, and the decision-making process they undergo to get there. There are hundreds – if not thousands – of search engines available to customers worldwide. How do we know that? We typed it in a search engine of course. So what does this mean for the modern marketing manager or sales rep? It means their job is no longer closing leads, it’s helping them on much more long term basis. At some point, the customer needs more reason, insight, and perspective than a bunch of URLS popping up on their computer screen. They need someone who is able to assist them with their marketing strategy at personal level, while still able to provide them with information at lightning speed. HubSpot has discovered a way to provide your team with the knowledge and resources of a search engine, but the experience and perspective of an account manager or sales rep. The best part? It’s free, it’s available, and it’s groundbreaking. Customer Relationship Management (CRM) is a necessary aspect of every business. Your company is probably building a database that defines your customers and their likes, dislikes, purchases, pain points…everything you need to know. How sufficient is your system? Is it taking hours a day to enter and sort through customer information? Current CRM systems can be costly for smaller businesses, but they are also lagging behind when it comes to updates. That’s where HubSpot comes in. The launch of HubSpot’s two new products, the CRM tool and the new Sidekick app, comprise to form the HubSpot Sales Platform. With the help of these products, as well as a sales acceleration system, your agency can now efficiently manage all of your customer relationships within HubSpot, at no cost. HubSpot’s CRM database is integrated with the marketing database, this means that both are based off of the same information. On top of that, this information can be filtered and sorted to fit your own preferences without any delays. HubSpot CRM is designed to help you track contacts, companies, deals, calls, tasks, reporting and enrichment. The Sidekick app (previously released as Signals) works seamlessly with CRM to help sales reps match their selling approach with the new buyer’s approach. It is manageable with both Gmail and salesforce, and it allows contact and company insight tracking, open and click tracking as well as a send-later feature. Once Sidekick is installed in your browser, a sidebar with details about the contact you are emailing will appear inside your inbox. Details include the contact name, company, social media profiles and your previous interaction. In another single click, you can get more information about the customer’s company, connections, and contacts. You can use this information when drafting content or you have the option of adding the information to HubSpot CRM. Once you add a contact, HubSpot will automatically create a new profile not only for the customer, but also the customer’s company. 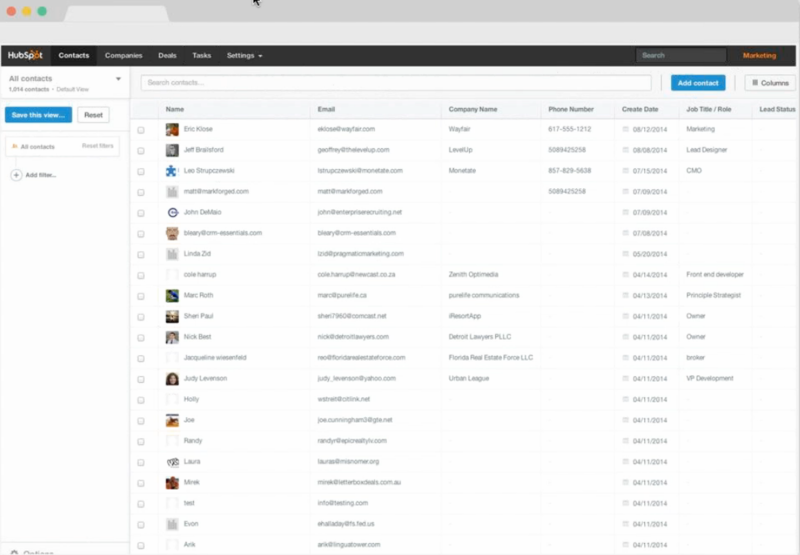 Shown below is a screenshot of HubSpot’s CRM contacts page. From here, you can click on a contact’s profile to view past history and every interaction you’ve had with the customer which is shown in a timeline. At the top of the timeline you will find links that allow you to make notes, send an email, make a phone call (available at an additional cost), log activity, or create a task. Sidekick not only makes a profile for your contact, but also for their company. Once you view a contact’s profile you have the option to visit their company directly. HubSpot records will appear in the sidebar, allowing you to add more company contacts right from the webpage you are working from. That’s not all. HubSpot CRM also allows you to create deals, assign them a stage in the closing process, the amount, and a description. All of your potential business deals are stored in the database and can be completely customized. Once these deals are closed, they are added to your timeline and reported in your sales dashboard. HubSpot’s new CRM and Sidekick programs will help you reach out to yours leads, target your best customers, optimize customer information, and focus on customer relationships on a one-to-one basis. Mostly importantly, it allows the modern inbound salesperson to help their customer in a more educational and consultative manner.